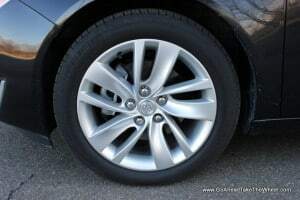 When you hear the name “Buick” what’s the first things that comes to your mind? American luxury? Cars driven by seniors? Well, there’s more to Buick than just those things. With attractive designs, more efficient yet more powerful engines, and new technologies, they are attracting new customers to their portfolio. And it doesn’t stop there. Buick also makes a mid-size luxury vehicle that’s actually sporty too, which is helping to attract even younger buyers to Buick. That vehicle is the Regal. 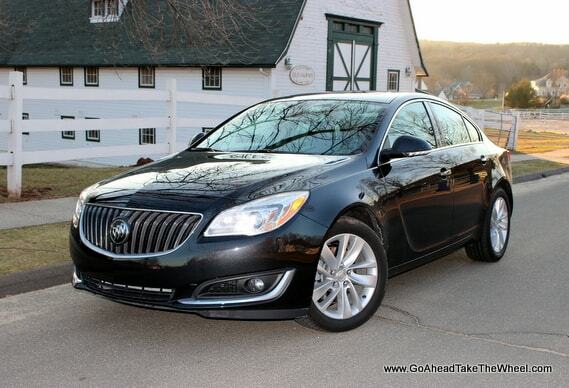 Although the Regal isn’t an all-new vehicle for 2014, Buick made some notable changes to it. The most notable is they’ve dropped the 220 hp 2.0L Turbo engine in favor of a more efficient and powerful 2.0L Turbo engine. Even better, they offer this new engine in a less expensive trim option. For example, a 2013 Regal Turbo with Premium I Group and 220 hp had a base MSRP starting at $31,530, while the 2014 Regal Turbo with 259 hp has a base MSRP starting at $32,485. However, the new engine is now available in a base trim that starts at $30,615. In 2013, you had to step up to the GS to get over 220 hp. 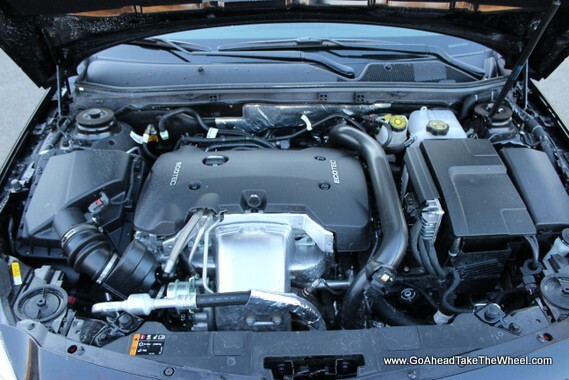 The 2013 Regal GS which delivered 270 hp is now down 11 hp for 2014 to 259 hp, but has a base MSRP of $34,980. Buick also now offers an all-wheel-drive system with an electronic limited-slip differential on the Regal to help deliver that additional power to the road in all driving conditions. Interestingly, it’s the packaging of the AWD system that’s responsible for the reduction in the peak hp numbers for the GS. To make room for it, Buick had to place a sharper bend in the exhaust creating more backpressure, thus reducing its power. According to Buice, overall performance is the same though. The Regal is currently in its fifth generation of production. It is slotted below the larger, and more expensive LaCrosse and above the Verano compact sedan. The Regal shares its platform with the Opel Insignia available outside the US. The 2014 Regal’s new standard 2.0L turbo 4-cylinder is rated at 259 horsepower and produces 295 lb-ft torque between 3,000 – 4,000 rpm. This is a big deal because it produces 18 percent more power than the 2013 Regal 2.0L Turbo that produced 220 hp. This additional power transforms the car. Acceleration from 0 – 60 mph feels quicker than the 6.8 seconds (6.5 seconds for the FWD model, and 6.2 seconds for the GS FWD with manual) implies. Acceleration is respectable at low rpms, but takes off once you hit 3,000 rpm until it tapers off at 6,000 rpm. Redline is 6,500 rpm although the maximum engine speed is 7,000 rpm. The engine’s sounds like a 4-cylinder, but a fairly smooth and quiet one. We find the engine is well matched for this car. Not only does the new engine deliver more power, but fuel economy is also significantly improved. It achieves 17 percent greater city mileage than the 2013 model for an EPA rating of 21 city / 30 highway mpg for FWD models with the automatic transmission, and 19 city /27 highway / 22 combined for AWD models. , electronically controlled, automatic overdrive transmission. It shifts smoothly and is great for normal driving, but shifts a bit slow when driven hard. 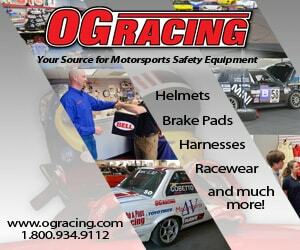 This should not be a big issue for most buyers since the Regal is not a car intended for track use. The automatic transmission can be shifted manually by pushing up or down on the gear selector. Paddle shifters are not available. A six speed manual is available as a no cost option in Regal GS with FWD only. Handling is impressive for a 3,959 lb. vehicle and feels on par with the best of its competitors in this segment. Its front suspension is an independent MacPherson strut-type with coil springs and hollow stabilizer bar. Our AWD model and GS models also come with Buick’s HiPer strut suspension designed to improve ride and handling. The rear suspension is a four-link independent rear with hollow stabilizer bar. FWD models get continuous damping control; AWD models get an H-arm suspension. GS models only get the Interactive Drive Control System. With the push of a button this system lets the driver tighten the suspension and quicken the steering response by selecting one of three modes: Standard, Sport or GS. We didn’t have the opportunity to play around with these settings since our car was not the GS model. The Regal’s ride and handling is unique because it doesn’t feel American, but instead feels very European. It’s a true performance sedan that feels light and nimble as opposed to feeling big, soft or heavy. 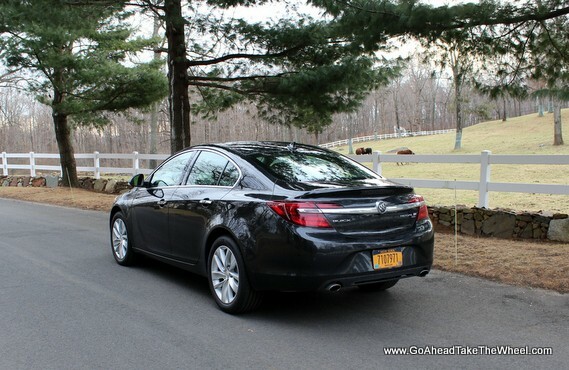 The ride is firm and can be busy on bumpy roads, which is atypical for a Buick. However, it isn’t overly firm or uncomfortable. Maneuverability in parking lots and tight spaces is average for a car this size. The turning circle is 38.1 feet. The electric power steering feels nicely weighted at all speeds but does feel a little artificial. Road noise from the tires is present, but fairly quiet and a small amount of wind noise make its way through on the highway. However, neither of these is bothersome or impedes conversations inside the cabin. n calipers in front and 12.4” vented discs with single-piston, aluminum calipers in the rear. Under normal driving stopping distances feel short and straight with just the right amount of pedal feel. GS models come with larger 13.6” discs in front with four-piston aluminum Brembo calipers for enhanced braking performance. Exterior styling looks like a rebadged Opel Insignia with a few Buick styling features to make it look like a Buick. For example, it wears Buick’s waterfall grille instead of Opel’s grill with horizontal lines. There are redesigned headlamps with wing-shaped LED lighting. The GS model features more aggressive vertical air intakes. There are a couple of non-functional hood vents to give it a little more attitude. On the side there is a side panel scoop, and a character line that runs through the door handles through to the trunk. It also wears 18” silver painted alloys with Michelin Pilot MXM4 Primacy P235/50R18 tires. The rear is defined by a chrome accent piece that extends through the tail lamps. There’s also a rear deck lid with integrated spoiler to add to the sporty (for a Buick) look. Like the exterior, the interior looks much like the Opel Insignia. The Regal comes standard with many luxury features that are optional on many other cars in its class. 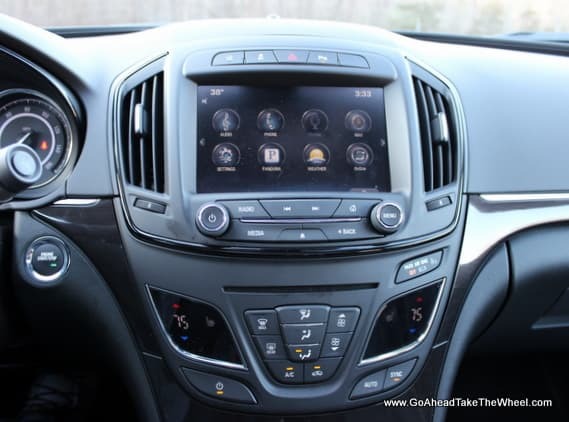 It has heated leather seating surfaces (which get very toasty), an eight inch color touch display with IntelliLink in-vehicle connectivity, and dual zone automatic climate control. Our Premium II model also came with EZ Key passive entry system that allows the driver to unlock the car with the keys in his or her pocket. It also allows for remote vehicle start and push-button start. Despite offering many luxury features standard that are optional on other luxury cars, cost cutting is evident with some soft touch plastics on the dash and door, and mostly hard plastics elsewhere. And although the seat surfaces are leather, a less expensive fabric is visible towards bottom of the seats. The seats on our test model are firm with a minimal amount of side bolstering. The sports seats in the GS provide more side bolstering. The steering wheel is thick and provides a comfortable grip. It’s heated too which warms hands nicely on cold winter days. 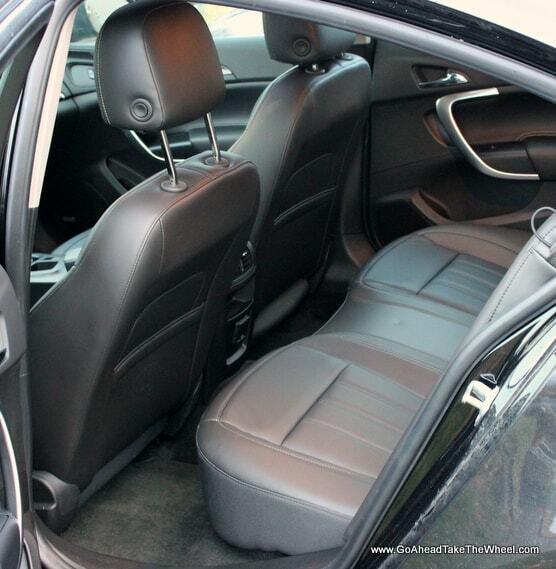 Buick says the rear seats accommodate three, but realistically we’d say just leave it to two. Rear seat legroom is tight. With the front seats in a comfortable driving position for me (I’m 6’1″), in the rear, my legs press against the rear of the front seat and my head hits the ceiling. ows you to pair your smartphone to make calls and play music. 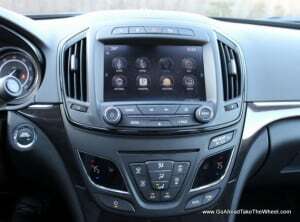 It also has navigation and a Premium Bose audio system. We were not impressed by the sound quality of it though. Even when set the way we wanted, we wished for clearer high notes and deeper lows. The buttons outside the touch display are nice and big, and well organized. Visibility is pretty good, but is hindered slightly by moderately thick A-pillars and C-pillars. While backing up in parking lots, the rear view camera with available Rear Cross Traffic Alert functions nicely as it warns you of oncoming traffic that you’re unable to see without it. Also available is Lane Change Alert, Side Blind Zone Alert, Lane Departure Warning, Forward Collision Alert and Collision Mitigation Braking. The trunk is roomy at 14.2 cu. ft. and can be open by either a button inside the driver’s door, by pressing a button on the key fob, or by activating a release while placing your hand under the trunk lid. Once the trunk is released, it pops open very quickly at the cost of making it quite difficult to close using the pull on the inside of the trunk. You must either use two hands or close it from the outside of the trunk. The opening is big so loading and unloading items easy. Trunk hinges are covered and won’t squash luggage. 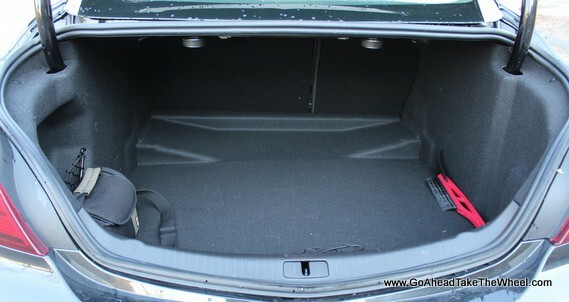 The rear seats fold 60% / 40% to expand the trunk if needed. The upper part of the trunk contains exposed speakers magnets and wiring, so you’ll want to be careful when loading the trunk to its limit. Beneath the trunk floor is a temporary spare tire. Other storage include door storage, two cup holders in the center console, center console change bin, ash tray compartment, felt lined glove compartment, pockets behind front seats and two cup holders in rear center armrest. 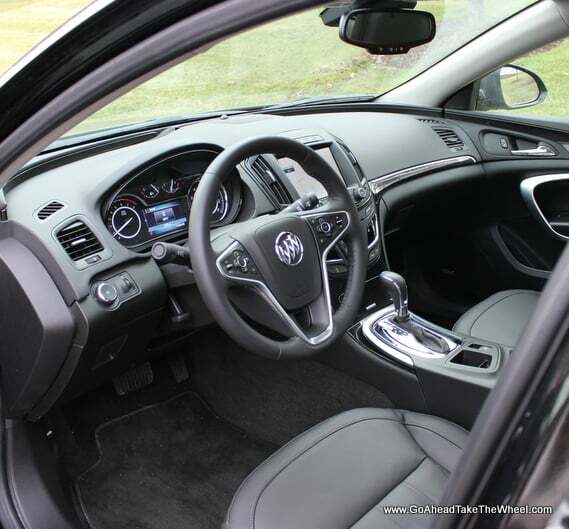 The 2014 Regal comes in four trim levels: Regal, Premium I, Premium II, and GS. AWD and eAssist models are also available. Pricing starts at $30,615; $32,485 for Premium I with 2.0L Turbo or eAssist; $34,685 for Premium II, and $37,830 for GS. Standard equipment includes next-generation IntelliLink; eight-inch color touch display; 18-inch alloy wheels; rear vision camera, leather-appointed seating surfaces, heated front seats and a new 2.0L I-4 engine. According to Buick, its key competitors are the Acura TSX, Audi A4 Sport, Volvo S60 T5, Lexus IS 250/350, Infiniti Q50 and Volkswagen CC. The Regal is an important car for Buick. It allows them to offer a sporty passenger vehicle with many standard luxury features to appeal to broader group of buyers. On paper it has some performance advantages over its competition too. But with an interior where cost management is evident, and a brand name that doesn’t have the cache as some of its premium German rivals, you’ll have a hard time trying to impress your neighbors who may have an Audi A4 in their driveway. On the other hand, with its new standard engine, the Regal offers more power, and can be purchased with many standard luxury features for a lower entry price than its premium German rivals too. Because of this, it’s worth putting the 2014 Regal on your test drive list if you’re looking for a sporty four door sedan in the $30K range. Just do yourself a favor and push it a little harder than normal to really appreciate it and see what it can do.